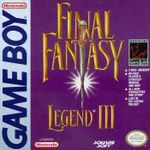 Final Fantasy Legend III, originally released in Japan as Jikuu no Hasha ~ Sa・Ga 3 [Kanketsu Hen]​ (時空の覇者　Ｓａ・Ｇａ３　[完結編] The Ruler of Time and Space ~ SaGa3 [Final Chapter]), is a role-playing video game developed and published by Square Co. for the Game Boy handheld system as the third game of their SaGa series. Initially released for Japanese audiences in December 1991, the game was made available in North America nearly two years later in September 1993. While the title retains many similarities to its predecessors in terms of style and gameplay, the game's development was headed by series newcomer Chihiro Fujioka, who also served as composer alongside Ryuji Sasai. The North American version of the game saw a re-release alongside the two other Final Fantasy Legend titles in July 1998 courtesy of Sunsoft. The story of Final Fantasy Legend III combines fantasy and sci-fi elements, with the player assuming the role of three characters who were sent back in time to prevent a massive global flood caused by a being known as the Pureland Water Entity from destroying the world. To accomplish their mission, the three heroes, along with companions aiding them on their journey, must travel through time by augmenting their flying time ship, the Talon, with 13 upgrade units from the past and future.